CE is a 56-year-old lady. She lives in Penang, down the road where our centre is. Sometime in March 2010 she was diagnosed with Stage 4 breast cancer. No operation was indication. A doctor in a private hospital tried RFA (radiofrequency ablation) for her tumours. She received two treatments with RFA – one to her breast lump and another to her bone. Unfortunately, by August 2010 the tumour recurred in the same left breast. She underwent 6 cycles of chemotherapy at a government hospital. The treatments were completed in May 2011, by which time all the lumps in her breast were gone. Six months later, in December 2011, CE developed breathing difficulties. Her lungs were filled with fluid. A month later, in January 2012, she had severe headaches for 2 weeks. The cancer had spread to her brain. She underwent 5 sessions of radiotherapy to her head. She was given painkiller medication. In February 2012, she had breathing difficulty again. She had pains in her left leg. The cancer had spread to her bones. The doctor at the government hospital gave up on her. She was referred to the Hospice. She was prescribed morphine. There was no hope. CE and her daughter came to seek our help on 17 February 2012. She was prescribed Capsule A, teas for her Bone, Lung, Brain and Pain. 24 February 2012: One week on the herbs, her condition improved. Her intake of painkiller was reduced by fifty-percent. Previously she needed to take 4 tablets a day, and after the herbs this was cut down to 2 tablets per day. She felt more energetic. Her facial expression was better. CE (patient): First day, I moved my bowels. Second day, I had diarrhea. Third day I had more diarrhea. Chris: The first few days of taking herbs, patients generally go through a “healing crisis” – a cleansing process. There could be more pain, you become more tired or you have diarrhea, etc. These are good. Do not take any medication, the problems will resolve by themselves. I have a patient who moved her bowels ten times a day after taking the herbs. Take it easy. Daughter: She had five bowel movements! C: Oh, ten times would be better! Take it easy and be patient. Now, do you still have diarrhea? CE: I have no more diarrhea. D: She does not need to take so much pain medication now. Before she took four times of medication a day. CE: After take the herbs, I only took painkiller twice a day. Today I only take one time. C: No need to take four times a day anymore? You need to take the pain medication if there is pain. It is no use to suffer. Take the pain killer if the herbs do not help you. You need to relieve the pain. Only thing is we don’t want to take too much of pain medication and be dependent on it. Okay, you took the herbs for a week now. Are you getting any better? P: I am more “cheng sin” (more alert). D: I don’t know if she has improved or not from the inside, but looking at her facial expression, certainly she is much better now. C: Patient should be able to know if she is “improving” or not. She should be able to “feel” the improvements. 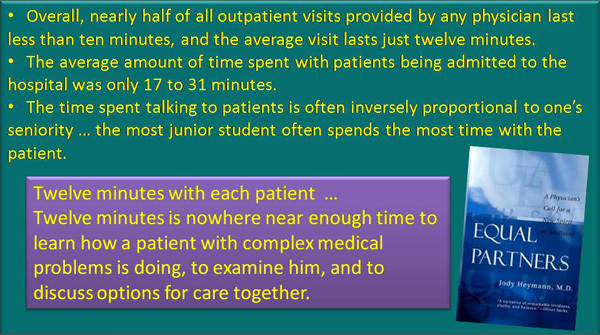 I too would be able to “see” if patients are getting better or not by looking and talking to them. And I tell every patient who come here – if you take our herbs for two or three weeks and you don’t feel any better, then stop coming to see me. The herbs are not good for you. Better that you go and see someone else for help. 2 March 2012: Unfortunately her health deteriorated. She did not look healthy. Both her legs were swollen. After some questioning, she admitted to eating “outside food” the whole week. Daughter: Both of her legs are swollen! Chris: Last week when you came, were the legs swollen? C: Do you still have pain? D: Her pain medication intake had increased to twice a day. This week she is less energetic. Last week she looked much better. C: Did she take care of her diet? Or did she start to eat anything she liked? D: This week I was not able to cook for her. My son was sick and so I was not able to take care of her (mother). C: So, the whole of this week she had been taking “outside (hawker) food”? D: Yes. The first week, I cooked her food. C: This is the problem. D: It was difficult for me. C: Are you the only daughter at home? D: I live with my family (husband, son and in laws) in Batu Ferringgi (about an hour’s drive away) but my mother lives in Batu Lancang (near our cancer centre). She lives with my sister and brother. But all of them are working so they have no time to take care of her. C: What about you? Are you working? D: Yes. But in the afternoon, I come to my mother’s house to cook for her. But this week my son was sick and I had to take care of him. So I did not have the time to cook for my mother. C: I understand. But in cancer, diet is very important. As you notice, the first week she was doing much better with no swollen legs. But this week her legs swelled due to bad diet. It is all about “bad” food. Indeed, there is nothing we can do really. Like they say, “A mother can take care of ten children, but ten children cannot take care of one mother.” I understand your situation. 1. Most patients come “shopping” for magic potion. 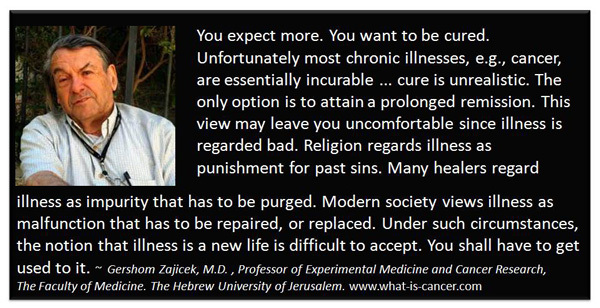 They expect us to cure them even after medical treatments have failed them. This is unrealistic. We are only human and we can only do that much and no more. This case is not an exceptional case. Read my blog, www.ADayWithChrisTeo.wordpress.com and you understand what I mean. 2. Our path to healing is not a “honeymoon” trip. After taking the herbs or change of diet, there will be a ‘healing crisis”. You will probably have more pains, more coughs, more bowel movements, etc. (Read more: Healing Crisis). Do not do anything to stop this cleansing process. The problem will solve by itself after a little while. No medication please. Remember that “healing crisis” is a law of cure. Without this happening there shall be no healing. 3. Diet is the most sore point among patients. When patients start to get well, they want to eat what they like. And after they have eaten all the “bad food” they write us asking why their tumour markers, like CEA, CA 125, CA 19.9, etc., had increased? What can we do? You reap what you sow! It is okay, if patients admit to their mistakes like in the case above. At least we can teach them to do it right the next time. But the worst cases are those who would not want to admit their mistakes and keep on denying that they followed our dietary advice to the letter. Well, there is nothing to be upset or dispute. Winning over this matter does not benefit anyone. For these patients, our advice is – Stop our herbs and find someone else to help you. 4. As said in the beginning of this article, cancer is not about a tumour in your body, it is about you as a human being. Many patients come and go, unfortunately never recognizing this important aspect – to them cancer is only a misery or disaster in life! Such people die or suffer in vain. They believe that their problems are due to outside factors. They don’t look into themselves to know what have gone wrong. Most cancer patients carry with them a load of unresolved personal baggage – bitterness, hatred, lack of love, family problems, etc. Unfortunately, no chemo, radiation or herbs can help in such matters. This is what I mean when I said in the beginning of this article, After talking to you for about five minutes I would probably know if I can help you or not. Your personality and problems show up during our conversation. And it is hard to change a patient’s attitudes and lifestyle – it has to be the person himself/herself who wants to change. Without change, no healing can ever take place.